To food lovers the world over, a trip to Paris is not complete without a visit to Poilâne. 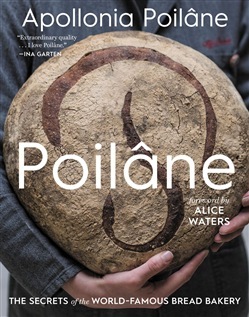 Ina Garten raves about the bread’s “extraordinary quality.” Martha Stewart says the P in Poilâne stands for “perfect.” For the first time, Poilâne provides detailed instructions so bakers can reproduce its unique “hug-sized” sourdough loaves at home, as well as the bakery’s other much-loved breads and pastries. It tells the story of how Apollonia Poilâne, the third-generation baker and owner, took over the global business at age eighteen and steered it into the future as a Harvard University freshman after her parents were killed in a helicopter crash. Beyond bread, Apollonia includes recipes for pastries such as the bakery’s exquisite but unfussy tarts and butter cookies. In recipes that use bread as an ingredient, she shows how to make the most from a loaf, from crust to crumb. In still other dishes, she explores the world of grains: rice, corn, barley, oats, and millet. From sunup to sundown, Poilâne traces the hours in a baker’s day, blending narrative, recipes, and Apollonia’s philosophy of bread. Acquista Poilâne in Epub: dopo aver letto l’ebook Poilâne di Apollonia Poilâne, Joanne Smart... ti invitiamo a lasciarci una Recensione qui sotto: sarà utile agli utenti che non abbiano ancora letto questo libro e che vogliano avere delle opinioni altrui. L’opinione su di un libro è molto soggettiva e per questo leggere eventuali recensioni negative non ci dovrà frenare dall’acquisto, anzi dovrà spingerci ad acquistare il libro in fretta per poter dire la nostra ed eventualmente smentire quanto commentato da altri, contribuendo ad arricchire più possibile i commenti e dare sempre più spunti di confronto al pubblico online.